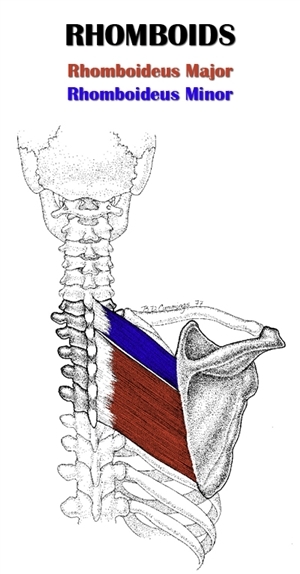 The back anatomy includes the latissimus dorsi, trapezius, erector spinae, rhomboid, and the teres major. On this page, you’ll learn about each of these muscles, their locations and functional anatomy. The back anatomy includes some of the most massive and functionally important muscles in the human body. Still, many individuals pay far too little attention to them. The back muscles enable you to stand up straight; support and protect your spine; and reach, pull and extend your arms and torso. Poorly developed back muscles lead to everything from muscle tweaks and pulls to imbalances of the musculature to the all-too-common hunched-over look (the “Neanderthal look”). All of these things can lead to long term back pain (and chronic complaining!). Luckily you’ve found this page to help you prevent would-be ailments. 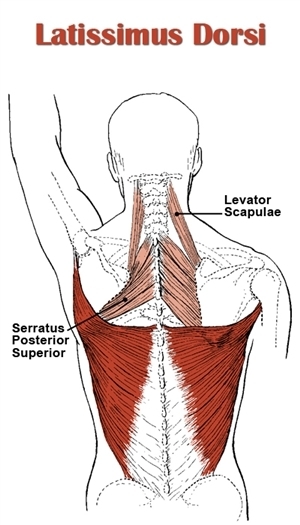 The latissimus dorsi, also known as the “lats” or “wings,” are the largest and most well-known of all the back muscles. Once large enough, the lats are responsible for your body’s “V-taper” because of their protruding appearance under your armpit area and on the back of your ribs. And as you might guess, they are the back muscles most commonly targeted by lifters in the gym. However, many fail to give them the proper attention required to reach their full potential. Your lats help you in pulling and reaching with your arms, and support your body in a variety of movements and situations. To target your lats, you can use a variety of popular back exercises, including lat pulldowns, pull ups, barbell bent over rows, dumbbell one arm rows, and deadlifts. The trapezius muscles are located between your shoulder and your neck. Since they extend higher than the collarbone height, they are most noticable from the frontal view; although they actually reach all the way down to the lower back region. The traps consist of three sections of muscle fibers: The lower trapezius, middle trapezius and upper trapezius fibers. The traps are quite a complex set of muscles. They control the scapulae (shoulder blades), which play a role in shrugging, neck movement, head support, and more. Most guys in the gym don’t pay enough attention to the traps, or they pay too much attention to the upper traps. However, an evenly and well developed trapezius muscles can highlight and excellently finish off a physique and prevent shoulder and neck problems. Shrugs, deadlifts and power cleans hit the upper traps the strongest. Dumbbell rear deltoid raises, cable face pulls, barbell rows and seated rows are better at targeting the middle and lower trapezius fibers. The erector spinae muscles, or spinal erectors, line your spinal column from the lower to the upper back. The spinal erecotrs allow you to flex and extend your back in any given direction. They also support and protect your vertebrae, meaning that stronger spinal erectors lead to improved posture and core stabilization. Deadlifts are the best exercise for developing these muscles. However, since so many gym-goers never do deadlifts, these crucial muscles typically receive disproportional attention. Although deadlifts are far superior, other exercises can hit these muscles as well. Examples include hyperextensions, the barbell good morning as well as the barbell squat (especially when using heavier loads). The rhomboid muscle. This muscle is located on the upper portion of the back anatomy, underneath the trapezius. They originate from the vertebrae and insert into the scapulae. 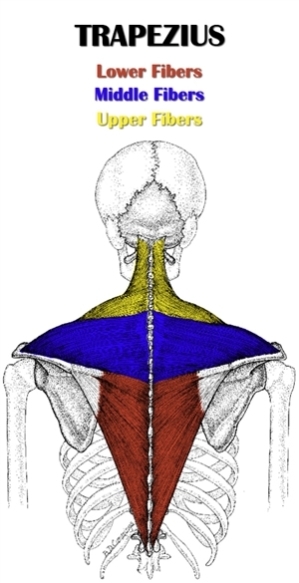 The rhomboid muscle is activated as you bring and squeeze your scapula or shoulder blades back and together. With that in mind, the best back exercises for targeting the rhomboids group are barbell rows, seated rows, t-bar rows, one-arm rows and pull ups/chin ups. 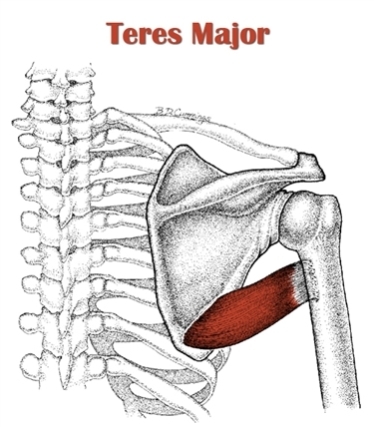 As you might imagine, the teres major works in conjuction with the lats. But it also is works with the rotator cuff muscles. Its functions include pulling the arms downwards and rotating them inwards. Straight-arm lat pulldowns and dumbbell pullovers most directly target this muscle. However, such isolation exercise are rarely necessary since you can sufficiently work the terest major using compounds back exercises, including various pull up and rowing movements. Great article, you cover so many aspects of the back muscles. My interest is how the deadlift can help to build mass and the back muscles and you have answered many of my questions concerning the back, thank you. For me, the deadlift is one of the greatest exercises because of how the deadlift helped me to rehabilitate my knees and strengthen my back. At one point, I could not walk because of a torn medial meniscus and despite my fear, I started to deadlift and squat (below parallel) and found that my legs were actually getting stronger. My walking got better and I have been gradually adding some running into the mix as well. I could barely walk, let alone run. So while deadlifting is a big mass builder, it can even help with the small but critical thing like walking that many of us take for granted. In addition I had pulled my lower back several years ago while reaching to open the door of my apt. Yes, how sad is that, but I know that I am not the only one who has faced lower back pain. Fortunately, since doing deadlifts, I have not experienced those back pains again. The power of the deadlift inspired me to write more about it as a tool to help people achieve both body and mind transformation. Thank you, Alex for all of the information and guidance that you provide. Thanks Alex for your article on back anatomy. I think I pulled a muscle. Just trying to pin point the correct area. That’s great to hear. I hope the exercise improves your back training once you’re all healed up. Here’s to a speedy recovery. Please provide details on thoracolumbar fascia, how to get the chrismas tree looking thoracolumbar fascia area. That’s really just a function of spinal erector hypertrophy and low body fat percentage. So lots of lower back exercises (e.g. deadlifts, good mornings, hyperextensions) as well as some exercises that emphasize the mid erectors (e.g. bent over rows, seated good mornings, lying superman holds), plus dieting down when you’ve built up sufficient muscle mass. Thanks! It’s very helpful to me. Just curious how to balance out my over-developed Teres Major? I’m female, new to heavy lifting since Jan. 2018 and have noticed these muscles are getting larger more quickly than the rest of my back. Are there exercises I should avoid for awhile? (I’ve been doing bench presses, shoulder presses, deadlifts, DB rows, single-arm DB rows, DB pullovers, pull-ups, and chin-ups). It’s probably to early to say whether these muscles are really overdeveloped relative to the rest of your back, since you’re a relative beginner. It’s likely that they just seem larger then the rest of your back because they (along with their big brother, the lats) are visually prominent muscles. That said, I’ll still answer the question as-is: to reduce emphasis, you’d want to do back exercises with less shoulder internal rotation and shoulder adduction. So, as a practical example, you could swap out pull ups for face pulls. YOUR ARTICLE IS VERY VERY HELPFUL. THANK YOU FOR POSTING THIS. Glad you found it so useful, Esther.